I finally bought myself one of those heart-shaped cake pans the other day and as soon as I picked it up I thought—“Hey! Mouse ears!” Mice and Valentine’s Day go hand in hand, right? This lit­tle Mouseke­teer is easy as pie to make—simply bake up a single-layer heart cake and get ready to pipe some pink ruffly but­ter­cream with the clas­sic open star pip­ing tip. You’ll need a small amount of fon­dant too for the mousy details! 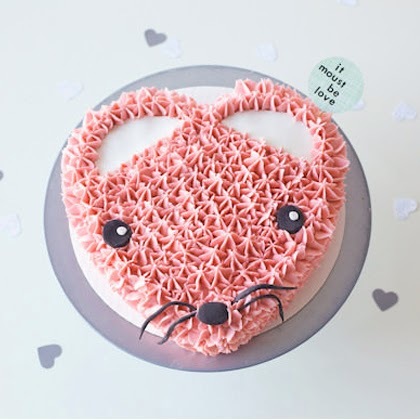 This Valentine’s Day, sur­prise your sweetie (mice = roman­tic) or delight your kid­dies with this pink heart mouse cake. Eeks!